The next time you find yourself settling down for a nice, long, relaxing ride on the New York City subways, think twice about dozing off. The next time you find yourself settling down for a nice, long, relaxing ride on the New York City subways, think twice about dozing off, because you might find an unflattering shot of your doze face on Asleep on the Subway. 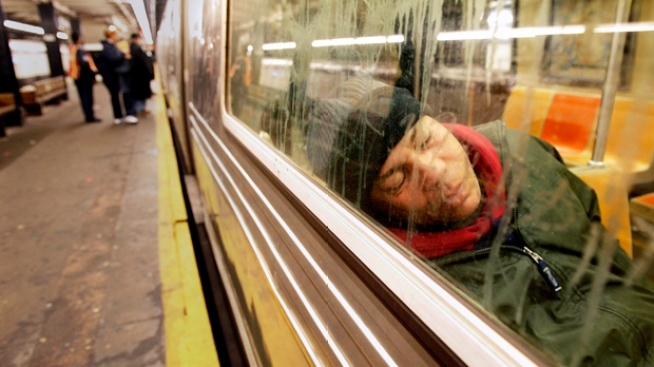 It's a new city-wide blog that posts reader-submitted photos of transit riders, well, sleeping on the subway. Why do such a thing, you ask? "Because seeing people fall asleep on the subway is a universal language," the blog explains, and quite frankly, the resulting photos are hilarious. So watch your backs, take your naps at work, because as Gothamist exclaims, it's "leaving no subway line safe to sleep on." Dozers...you're exposed.